This recipe was pretty easy, and very tasty. I will definitely make this again, thanks Martha! 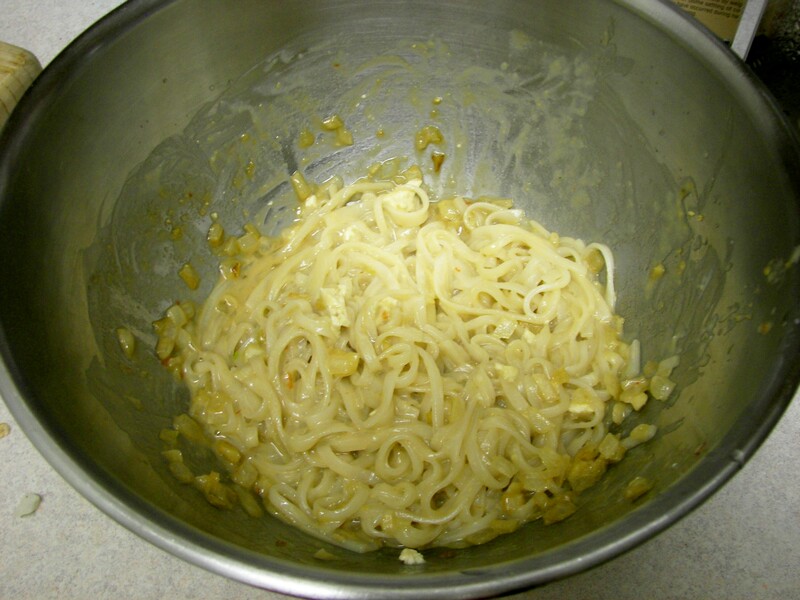 Bring a pot of water to boil, add noodles, stir and remove from heat. Let stand until tender, about 8 minutes. Drain and rinse with cold water. Heat the oil in a large skillet or wok over high heat. Add the cabbage and stir fry until mostly wilted and golden, set aside. 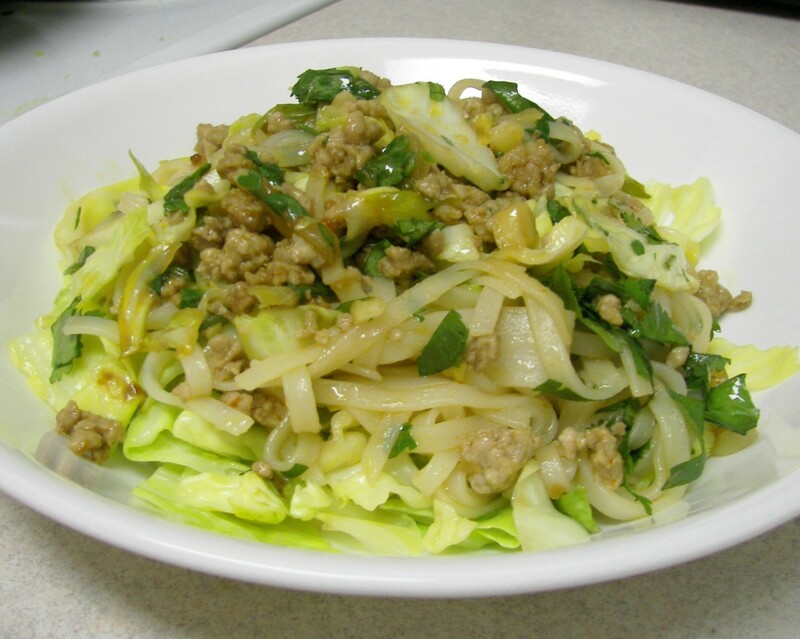 Reduce the heat to medium and add the ground pork, garlic, ginger, and white parts of the scallions. Cook until pork browns. Stir in fish and chili sauces, toss in rice noodles and cabbage. Add soy sauce. Remove from heat and add the rest of the scallions and the cilantro, squeeze the limes over the noodles and serve immediately. This is always a favorite, it’s like noodles with a peanut sauce, but instead of peanuts it’s sesame seeds. This is adapted from Blue Eggs and Yellow Tomatoes. Combine the tahini, soy sauce, brown sugar, and sambal oelek together in a large mixing bowl. Heat the sesame oil in a small saute pan over medium high heat, saute the onion, garlic, and ginger until the onion begins to brown. Add to the tahini mixture. Cook the rice noodles according to the directions on the package. When they are tender add them to the sauce and combine well, adding some of the cooking liquid if needed. You can serve this with almost any type of protein. I served it with tofu, which I think always goes well with this type of dish. I simply drained, cubed, and mixed the tofu with some of the sauce. This was enough for me, I do love tofu. Make sure you get the type of tofu that’s in the water, extra firm- Nasoya is my favorite brand. 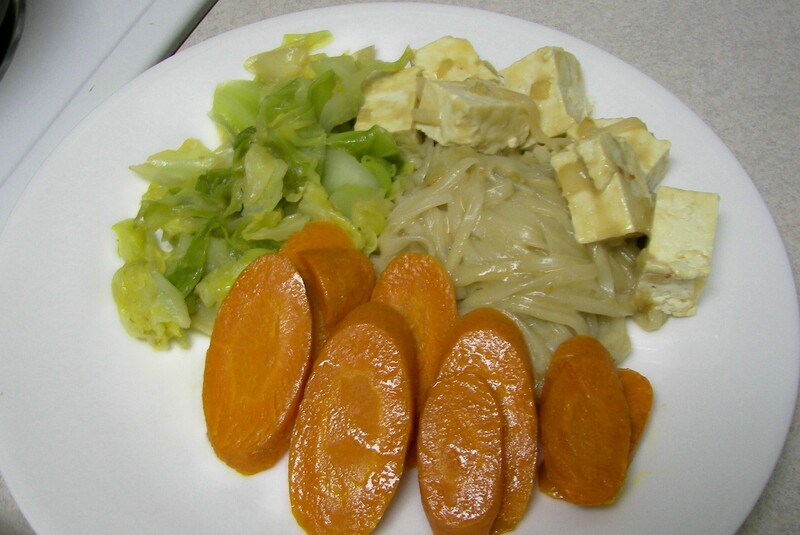 I also sautéed some cabbage with garlic, ginger, and soy sauce, and added some steamed carrots. Yum!